EAST FLATBUSH — A large complex of affordable and supportive housing on the campus of Kings County Hospital is nearly halfway built, with more than 200 units completed and work on another 300 underway on the border of Crown Heights and East Flatbush. Leaders from the city, state and the non-profit CAMBA — which is leading the development of the project — broke ground Monday on CAMBA Gardens Phase II, a 293-unit building to be constructed on the site of KCH’s former psychiatric hospital. Once completed in the fall of 2016, the building will house families earning less than 60 percent of the area median income and people exiting the city shelter system, CAMBA said, with case management, counseling and health care assistance offered to all tenants. By combining supportive services together in one location, officials hope to reduce overall costs of care. “The two buildings together will save us over $3 million a year in emergency taxpayer costs including shelter, hospital emergency rooms and jail,” said Jessica Katz, assistant commissioner at the Department of Housing Preservation and Development. “We recognize that affordable housing, access to supportive services and quality health care need to work concurrently to ensure a quality life,” said Joanne Oplustil, president and CEO of CAMBA, of the new project. Next door to the new construction site, more than 209 residences are ready for tenants at CAMBA Gardens Phase I, a 193,000-square-foot housing complex built in a formerly underutilized KCH building, which officially opened Monday as construction at the second building began. Many residents of the first building have already moved in, including Elizabeth Melendez, the mother of a 21-year-old son and 16-year-old twin daughters born with developmental disabilities. “I couldn’t fight as much as I wanted to. I fought as much as I could,” she said. But she found luck last summer when CAMBA accepted her application to CAMBA Gardens I at 738 Albany Ave. at Clarkson Avenue. Last March, she and her family moved into a brand-new three-bedroom apartment. 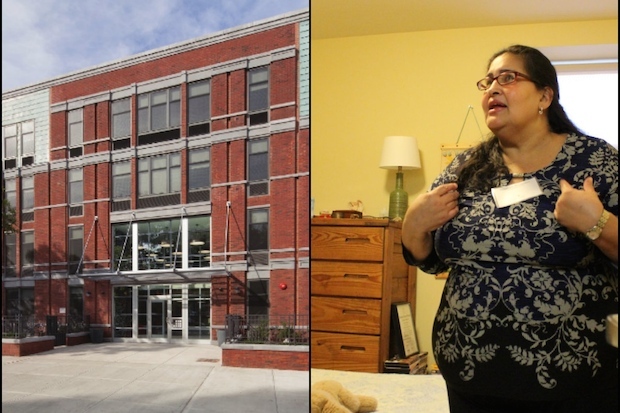 Tenants at CAMBA Gardens pay 30 percent of their annual income toward rent, a CAMBA spokeswoman said, and the rest is subsidized by the nonprofit and the state. The building project will cost $165 million, $100 million of which is funded by New York State. Phase I includes a rooftop solar panel array designed to reduce energy consumption by 45 percent, several multi-purpose rooms, gardens and a rooftop terrace. Phase II will include community rooms for health services, adult education and a computer lab in addition to 60,000 square feet of landscaped outdoor space, open to the public. More than 7,000 people applied to live at the first phase of CAMBA Gardens, the CAMBA spokeswoman said. Tenants of the second phase of the project will be determined by a lottery conducted by HPD when the building is more fully constructed, she said, which will be publicized on both CAMBA and HPD's websites. For more information about the CAMBA Gardens project, visit CAMBA’s website.